The National Union of Petroleum and Natural Gas Workers (NUPENG) and the Nigeria Labour Congress (NLC) Lagos State Chapters, stormed the premises of the Ikeja High Court to register their support for T.B. Joshua and The Registered Trustees of The Synagogue, Church of All Nations (SCOAN). 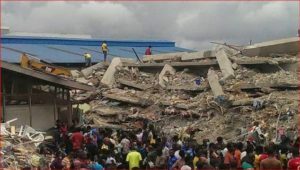 This took place during the resumed hearing on Friday, April 8, 2016 into the case involving the contractors that handled the construction of the collapsed building at The SCOAN in September 2014. The delegation from NUPENG carried placards with inscriptions like: “WE WANT JUSTICE FOR T.B. JOSHUA”, “IT WAS A BOMB ATTACK”. Meanwhile, a representative from NLC told journalists that from all indications, the building had been sabotaged. He argued that the way the ill-fated structure collapsed was strange and did not suggest structural failure in any way. They promised to meet the Lagos State Government to demand a review of the whole matter, stressing that the state should not allow a miscarriage of justice. “We strongly believe that the Synagogue building was bombed based on what we saw in the CCTV footage and from the way the building fell flat in one swoop”, said a NUPENG delegate at the court. Meanwhile, Justice Lawal Akapo of the Ikeja High Court has adjourned proceedings to Tuesday, April 19, 2016 for ruling in the applications filed by counsel to the defendants at the Court of Appeal. Lateef Fagbemi (SAN), E.L Akpofure (SAN), Titilayo Akinlawon (SAN) and Olalekan Ojo, all counsels to the defendants, argued that the court should stay action pending the determination of the suit they have filed at the Court of Appeal. Last week, a delegation led by NLC Lagos State Chairman, Comrade Idowu Adelakun, paid a courtesy visit to Joshua, calling on the government to drop its charges against The SCOAN and praising its impact on Nigeria’s tourism industry. “The Synagogue Church of All Nations (SCOAN) remains the only ministry in Africa that attracts the highest number of foreign visitors thereby boosting the religious tourism potentials of Nigeria and also earning huge foreign exchange for the country,” he said.